Timex, spring 2016: Here are just a few selects from a great-looking collection. 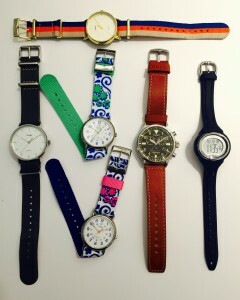 I had the chance to check out Timex’s new collection of watches launching this coming spring. Timex has always been my favourite brand of watch; as a kid, Timex was on my Christmas wish list. As an adult, I’ve treated myself to them exclusively over any other watch brand. In fact, when I was living in Hong Kong during the 1990s, my mother sent me a new Timex for my birthday because I commented I’d left mine behind in Canada and couldn’t find the brand there. My loyalty is, in large part, because of one simple feature: Indiglo. The built-in night light is great when you’re in a dark cinema, on a night flight–anywhere dark. Yes, you can use your cell phone to check the time. But when I’m on a trans-Atlantic flight–which is at least a couple of times a year–and I’m trying to snooze, wondering if I have slept at all, I don’t want to go digging around for my cell phone. I just want to look at my wrist. It’s a small convenience, but one I wouldn’t travel without. Indiglo used to be available in only selected Timex styles. What I find so cool about the upcoming Spring 2016 collection is that almost every one of them features Indiglo. Fantastic looking styles and colours, too, as you can see in the photo above. I’m looking forward to trying out the new Timex GPS watch, and one of its fitness trackers; watch this space for a review in the next few weeks, after I test them out.